dance around it. 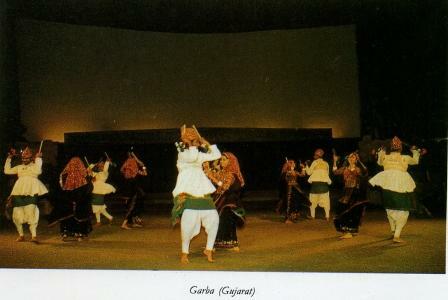 While dancing they sing garba songs which were written long long ago. The percussion music is provided by the drum called dholak. Garba songs are tuneful and the dancing is fascinatingly lyrical. There are various kinds of Garba which are danced by girls of every caste and community. The men folk of Gujarat perform Raas dances on this occasion. Basically, however, Raas dances are connected with agricultural operations. Among the Tharu community of Kumaon region of Uttar Pradesh, Tharuba dance is prevalent in which a boy dressed as a girl performs. The Tharuha dancers are also skillful as the Gotipuas and the Sattriya dancers. There are various kinds of dance movements, of which some have acrobatic elements. A dancer while dancing, at times, spins a large brass plate on the tip of the forefinger of the tight hand. The dancers are in a sense professionals since payment is made to them for their performance. They are accompanied by the drummer who plays Mridanga, a drum with two faces. He also sings while playing the drum. A few musicians play cymbals. The musicians form a circle and at the centre the Tharuba dancer performs. In 16th century, Shankaradeva, a devout Vaishnava and a creative genius of Assam shaped a stylized theatre to give vent to his spiritual feelings. He wrote several Ankianats i.e. one act plays, the performance of which is called Bhawana, literally meaning contemplation or meditation. The Ankianats were performed in the Vaishnava monasteries called Sattra. In Bhawana performance, female roles are played by boys. The performance includes several solo dance passages which are performed by the boys. When these solo passages are performed not as a part of the drama but independent presentation, they are called Sattriya dance. The dance is accompanied by singing and percussion music of Khol, the drum with two faces much like the Pung of Manipur, and Manjira, small cymbals. The counterpart in Andhra Pradesh is the Kuchipudi dance. Kuchipudi is actually a tradition of dance drama which has solo dance passages lie the Bhawana. When the solo passages are presented independently it is also called Kuchipudi. Since it has been accepted as a classical style of dance, it is not discussed here. In fact, both the Gotipua dance and the Sattriya dance are more sophisticated than most of the folk dances and have classical elements like the dance of Maibis of Manipur. Counterparts of Bachcha Nagma are found in Orissa, Assam, and among the Tharu community of Uttar Pradesh. In Orissa the teenaged boys who perform the dance are called Gotipua. The Gotipua dance evolved around 17th century. 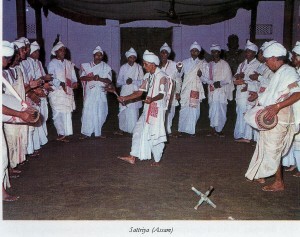 In southern Orissa especially in the district of Ganjam, the dance is called Sakhi Nacha. The tradition evolved around 17th century. The temple dancers called Maharis could not get the enthusiastic patronage of royal court. As a result, their dancing started declining for lack of proper training in dance. The Raj-nartaki class of dancers who were dancing at the royal court and also for the public during festivals like Vasantotsava, also disappeared owing to lack of patronage, since the royal nobilities preferred more sensual dance of the courtesans called Baiji. To cater to the general public the tradition of Gotipua evolved. During 17th and 18th century a number of talented Oriya poets wrote countless lyrics and poems suitable for singing, on the theme of the love between Radha and Krishna. Although lyrics were written in a simpler language, the poems are highly ornate. Generally, the Gotipua sing these songs and poems and present expressional numbers with highly stylized gestured acting (abhinaya). During the later part of 19th century and early decades of 20th century some kind of decadence crept into the Gotipua dance and it became more sensual than sensuous. In the 1940s, when the Odissi dance was revived much was offered by the repertoire of the Gotipuas. Following the classicism of the revived Odissi dance, the Gotipuas discarded the decadent elements.At present, their dance has been much influenced by the revived Odissi dance. Musical accompaniment is provided by Mardala, a Pakhawaj like drum with two faces; Gini, small cymbals and Harmonium. The dancer sings the song which is repeated by guru and a supporting vocalist when the dancer elaborates on the meaning of the song or poem through gestured acting.